It’s not something most of us think about until it’s too late. Your keys are in the car, the door’s locked, and you don’t have access to a spare? What can you do? The best answer is, of course, to call a locksmith. But, is there a way to prevent getting yourself locked out of the car? The best way to deal with this is to not to have to. So, what are the best tips? A lot of prevention for a car lockout has to do with developing the best possible habits for yourself. Getting into good habits with your keys will help you dodge the unwanted situation of finding yourself on the outside looking in. Here’s some of the best practices you can employ to make sure you don’t find yourself locked out of your car at the worst possible time. 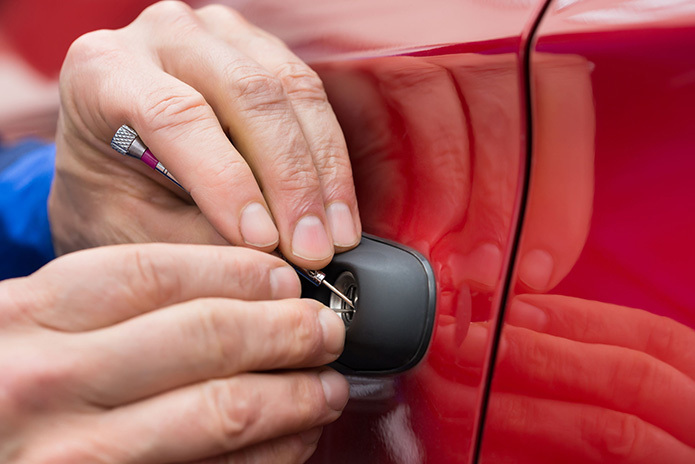 Many people get into the habit of hitting the lock button on the door inside their car. This can lead to a lockout when you close the door only to realize your keys are still inside, but the door has already been locked. To avoid this, get into the habit of waiting until you’re outside of the car to lock it, where you’ll need your keys to do it. It’s not just a matter of having a spare key but being smart about where you keep it. Don’t put it where you can’t reach it when you need it, and don’t keep it with your main key. Key it in a purse or wallet or somewhere else on your person where you can easily access it in the event of a lockout. Attach a bell or colorful lanyard to your keys to make them noticeable and hard to ignore. So you don’t forget your keys in your car or somewhere else, make them hard to forget. You’ll be less like to lose them or forget them if you can easily spot them. Are There Ways to Get into a Car Without a Key? If you want to try getting into the car yourself without causing it damage, there are ways on older models. If the car you’re locked out of has manual windows, you can manually get the window down, if it’s already partially down, with slow movements down and side to side. With a remote starter you could run into a similar problem. The remote starter allows for an unlock and start without keys and just requires the driver to be in close proximity to the car. But, if you lose the remote starter, you’ll be in a similar situation. So, changing your habits and knowing your local, trusted locksmith is the best bet. Getting locked out is frustrating and even scary for many people. But knowing how to avoid the situation and what to do and who to call if you find yourself in it is key to making sure it doesn’t turn into a full-blown emergency. Find out who your local locksmiths are and be prepared.